1907-1909 (or 1910): 407-425 Dearborn Ave.
1911 (or 1910)-1916: 701-727 Dearborn Ave. There is little information available about the Adelaide Series: it was one of the dozens of cheap reprint series offered by Donohue in the first few decades of the 20th century. There are no books with the series name included in WorldCat due to the lack of the series name on the book itself (it is only on the jackets). There are few mentions of the series in contemporary books and periodicals, meaning it was probably not advertised. 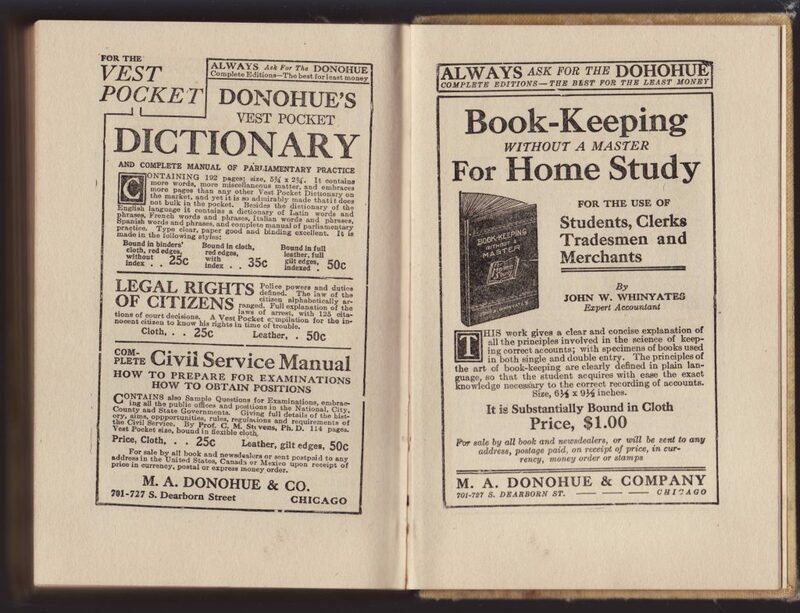 The jacket lists the address for Donohue & Co. as 701-727 S. Dearborn, which places the series in the 1910-1916 time frame. 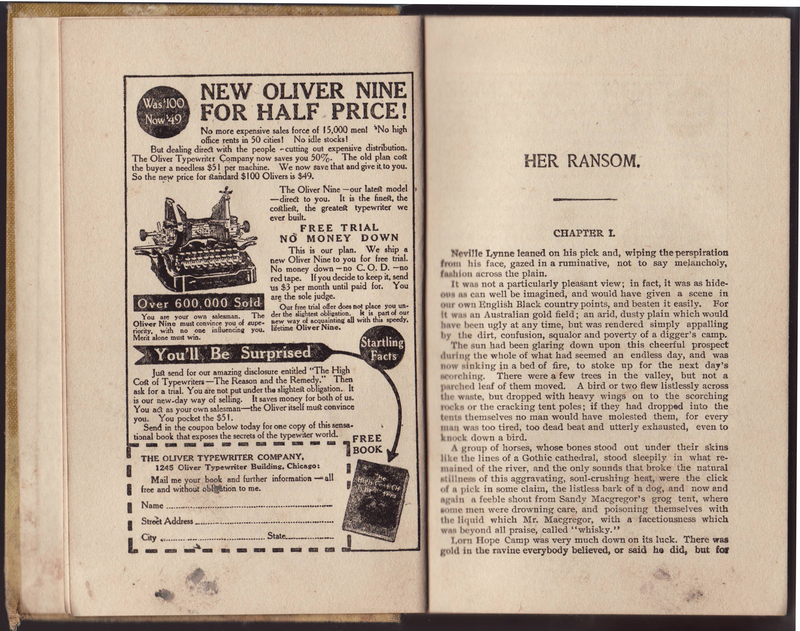 Charles Garvice’s Paid For was seemingly first published by George Munro in 1890 as part of the Laurel Library. Under the name Her Ransom, It was published in 1898 in Lupton’s Chimney Corner Series (#31) and Street & Smith’s Eagle Library (#50). These may have been pirated printings. 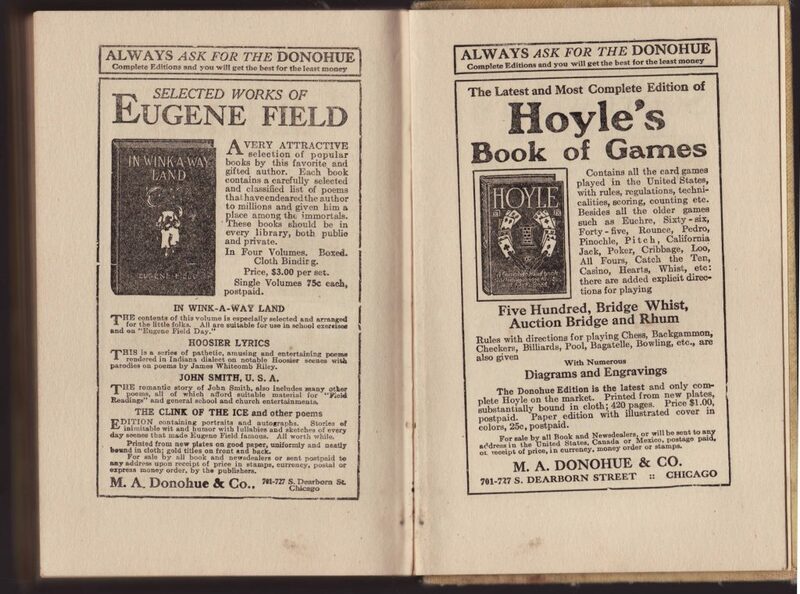 Hurst, of New York, included the title in its New Argyle Series (hardcover) and Hawthorne Library (paperback) in 1902. 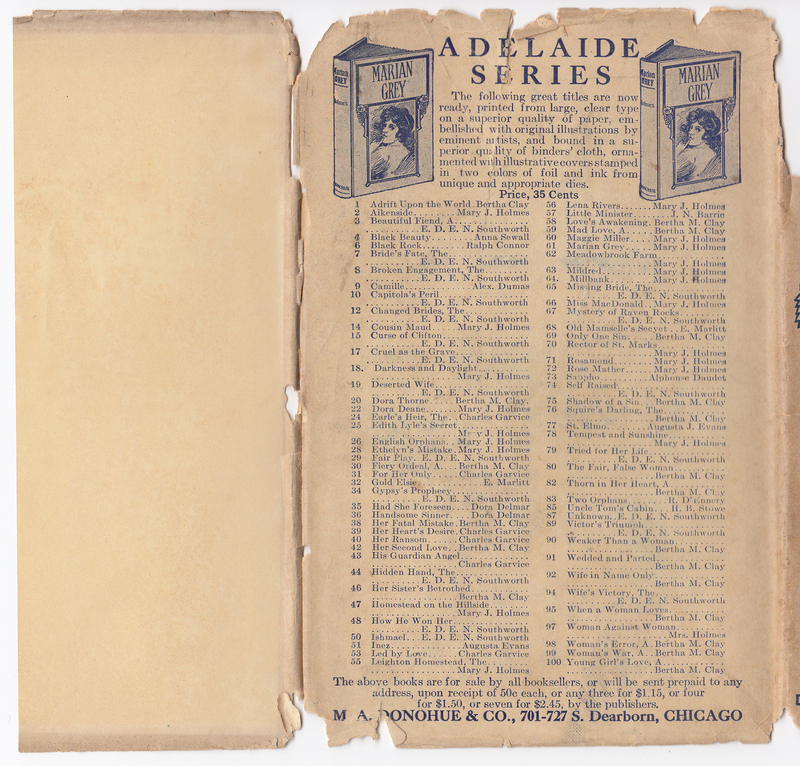 Chicago bookseller McClurg’s Retail Catalogue of Standard and Holiday Books for 1913 lists the 100 titles in the Adelaide Series and Her Ransom title at .35 cents per volume. 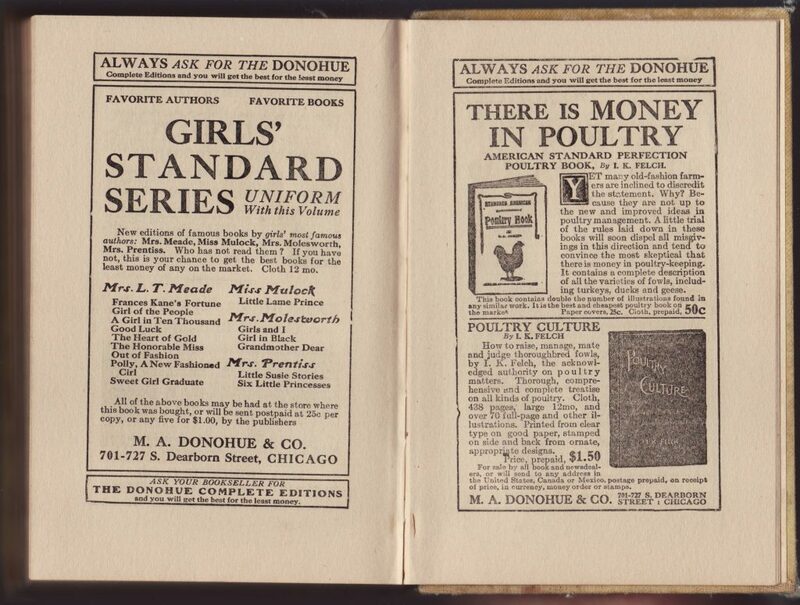 They were simply a series of 100 older low-grade fiction titles, of which Donohue had acquired the plates, from which they were hoping to squeeze a bit more revenue. This title is a great example of the recycling of a book (and its plates) through a half-dozen series over a few decades. The jackets for this series were semi-unique to each title. 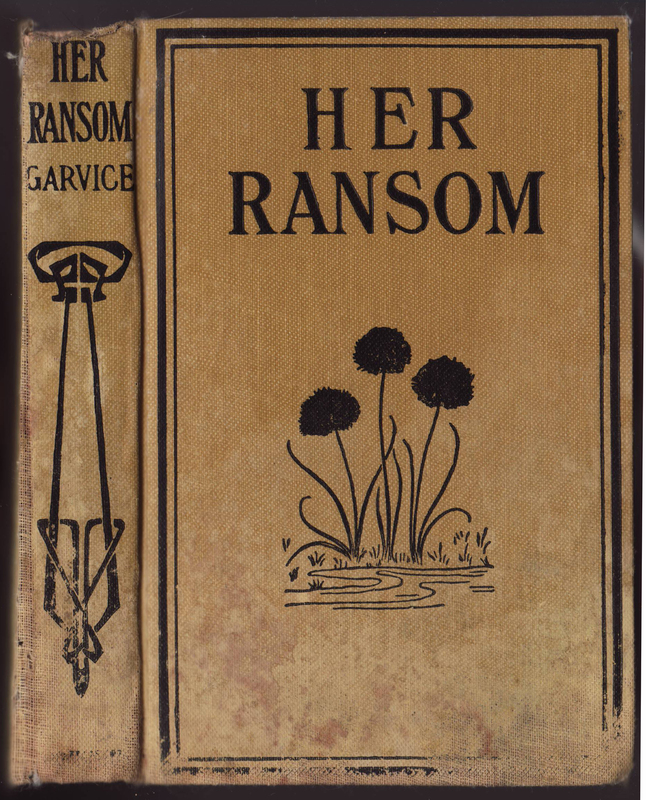 In the case of Her Ransom, the jacket spine is largely missing but includes the title and author and bits of the arts & crafts decoration found on many of these early 20th-century reprint series. 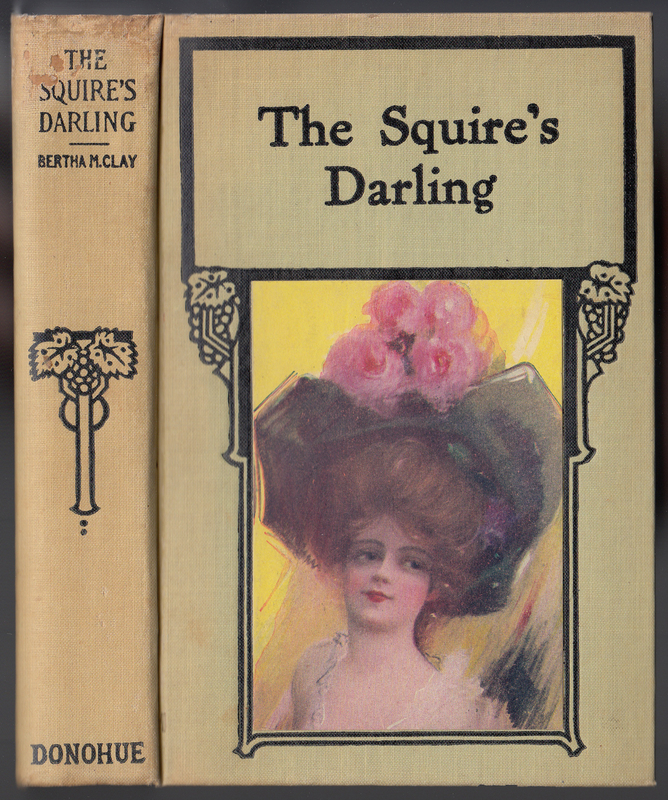 The jacket front is dominated by an illustration of what is undoubtedly the heroine of the novel, wearing a massive chapeau, nearly 5 feet across. These jacket (and sometimes book) cover illustrations were most likely small in number and were used on more than one title in the series. Oddly, the author’s name is not on the front of the jacket. 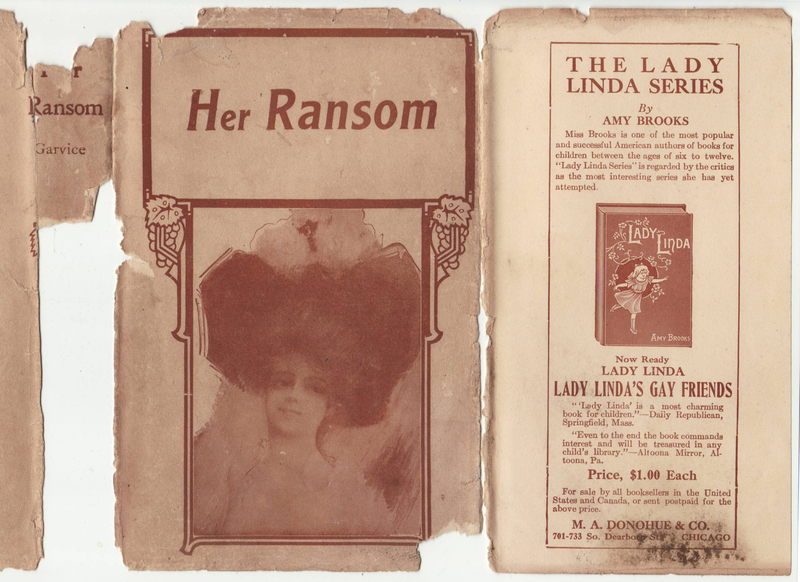 The front jacket flap advertises The Lady Linda Series by Amy Brooks, as published by Donohue. The rear of the jacket lists the 100 titles in the series. The series is described as containing “great titles” printed in “large, clear type” on quality paper and with two color book covers decorated with “foil and ink.” The fact that this book does not have the more decorative cover (see below) may suggest a later printing (in a cheaper binding). The 100 titles are a who’s who of mediocre but popular late 19th and early 20th-century fiction authors. Many are by women but a few are authors of the male persuasion. The series is numbered, oddly, using the alphabetical order of the book titles. This suggests the books in the series were published all at the same time, and no additional titles were added to the series. The books can be ordered from the publisher for .50 cents, including postage (or 3 for $1.15, or 4 for $1.50, or 7 for $2.45). 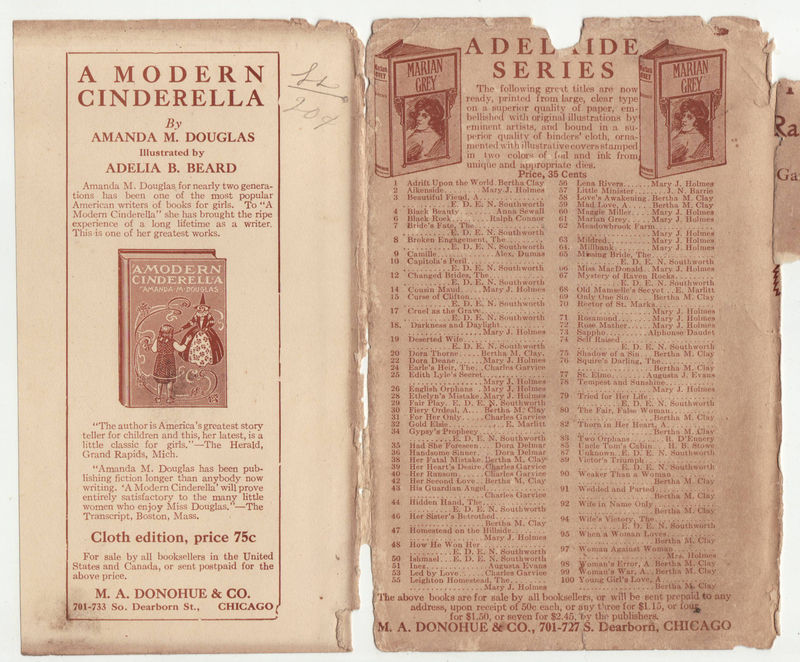 The rear jacket flap advertises A Modern Cinderella by Amanda M. Douglas. The bindings are cloth, with black printing: not the more decorative binding advertised on the jacket. There is a pattern with these cheap early 20th-century reprint bindings, whereby an initial decorative (and more expensive) binding is replaced by later printings in cheaper bindings. If that is the case here, the jackets were not modified to reflect the less decorative binding. The book’s spine probably reflects the design of the (missing) jacket spine above. The book’s title is on the front of the book with more decorations and a border. There is no half-title page. 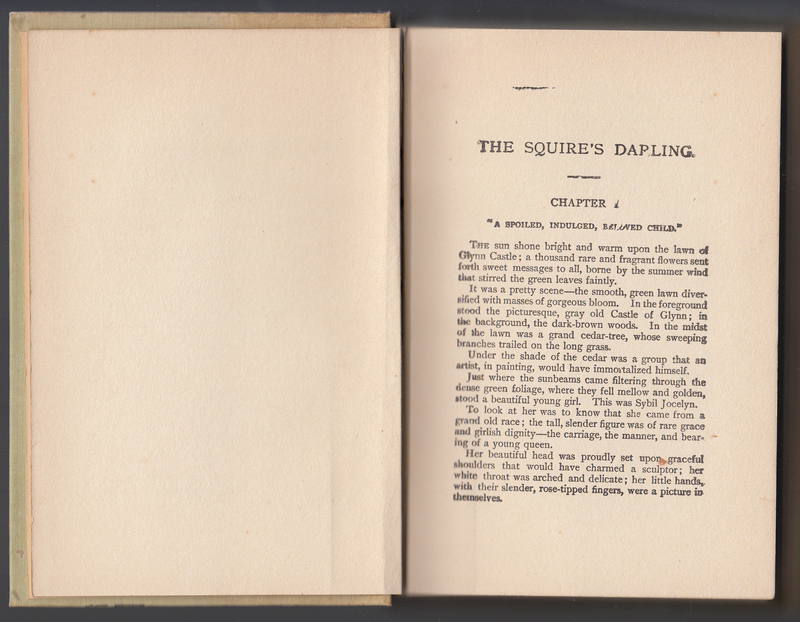 The title page is minimalist in design. There is also no copyright indication nor date in the book. Instead, an advertisement for discount typewriters rather ignominiously faces the first page of type. Despite the claims on the jacket for “large, clear type” the text is, instead, small and smudgy, evidence of old, worn printing plates. 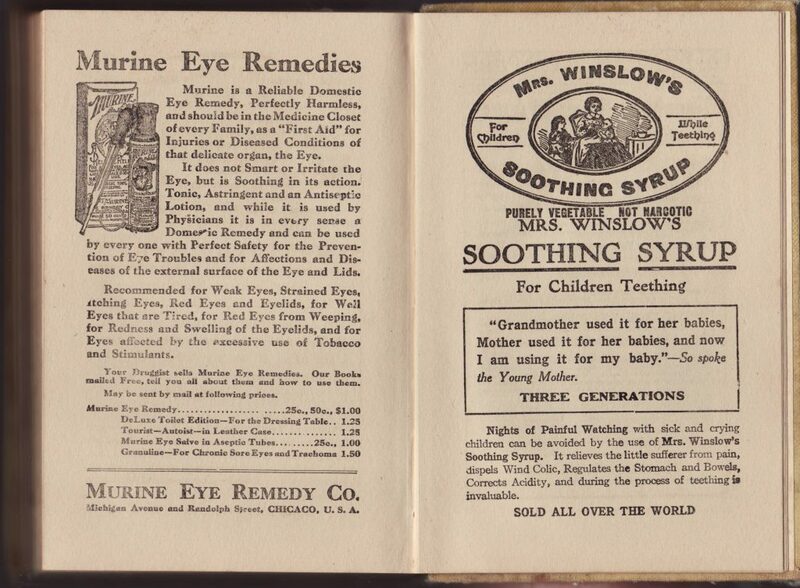 The rear of the book contains advertisements, beginning with eye drops and alcohol-infused “soothing syrup” for children. The rest of the advertisements are for Donohue books, most pages headed by the publisher’s advertising slogan: “Always ask for the Donohue.” Advertisements include those for a series of books of plays and oratory, reference books, juvenile fiction series, poultry books, dictionaries, home-study books, popular author collections, and a card game guide. A slightly later issue from the Adelaide Series is Bertha M. Clay’s The Squire’s Darling. The address in the book (701-727 S. Dearborn, Chicago) indicates printing in 1911 (or 1910) to 1916. 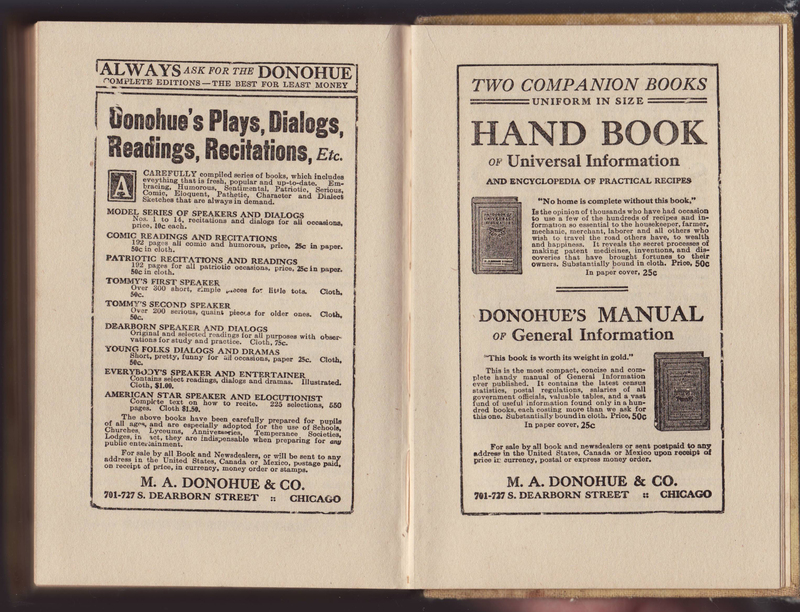 The rear of the book includes a bookseller (established in 1916) indication that suggests the printing date of the book is closer to 1916. The book is otherwise undated. The jacket spine and front are similar to the earlier title (above) but with the title and author swapped out. A different illustration is used on the front of this jacket. Unlike the earlier copy, the front jacket flap is blank. The author’s name is absent from the jacket front. The rear of the jacket seems unchanged, but for the publisher’s address, from the earlier copy (above). Again, the flap is blank. 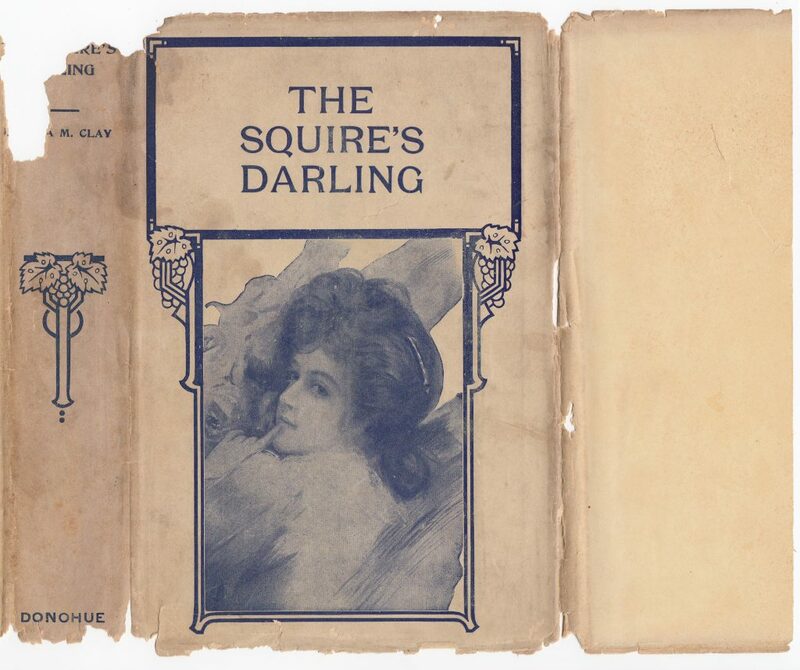 The book’s binding is modified from the earlier title above; a different design is used on the spine and a color image is glued on the front of the book. 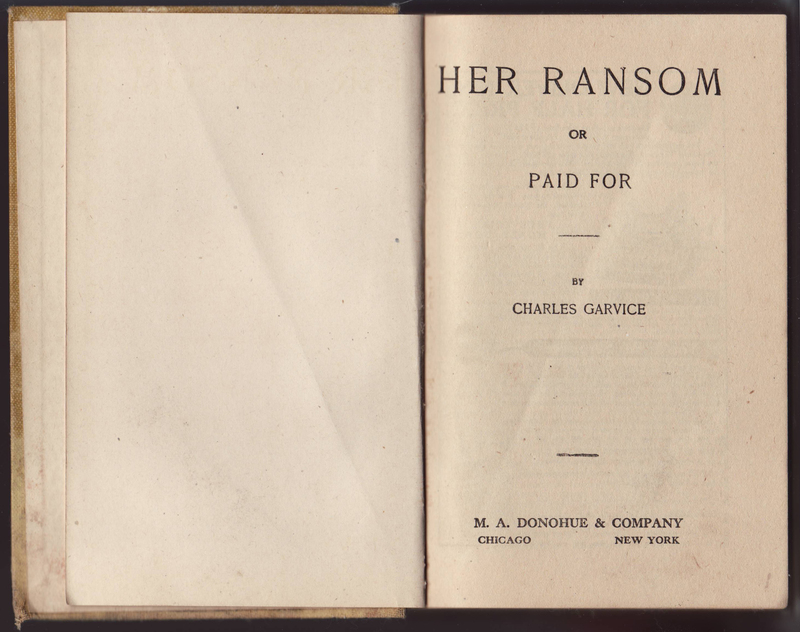 Oddly, the image used on the book cover is the same one, albeit in color, used on the jacket of the Her Ransom title above. It is likely that Donohue had a small number of generic illustrations with they reused, apparently without matching jackets and books, on the titles in this series. 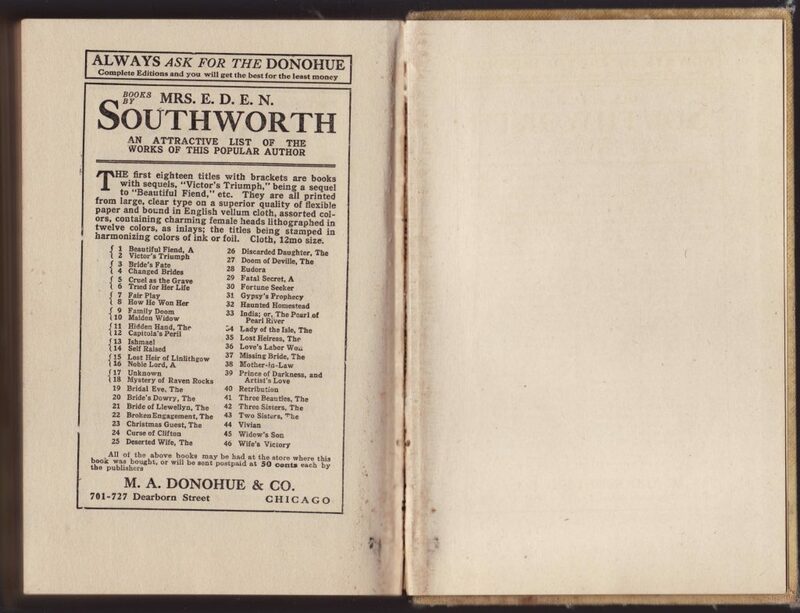 This copy also lacks a half-title page. 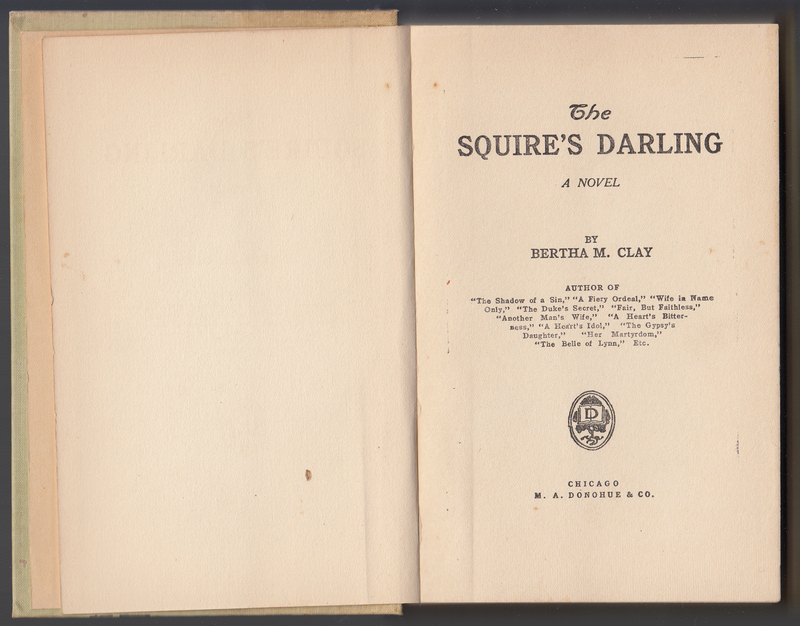 The title page is similar to the earlier copy above, but with a smaller publisher’s imprint. 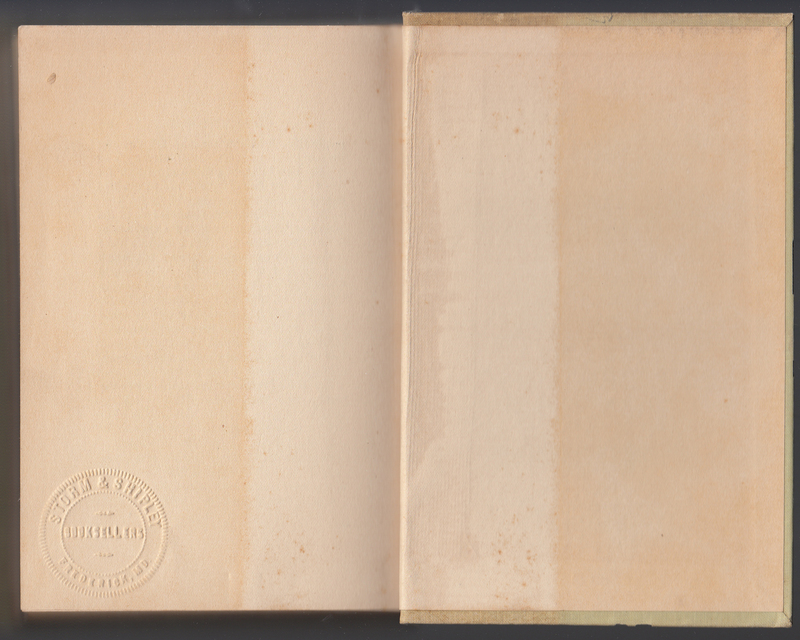 The rear endpaper includes an embossed bookseller indication: Storm & Shipley of Frederick, MD. That firm was established in 1916 (Geyer’s Stationer, February 16, 1916).